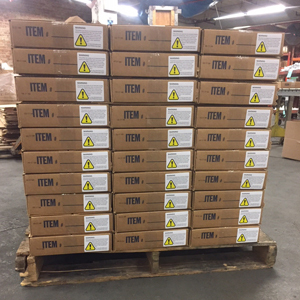 Midway Displays, Inc. products comply with the environmental Coalition Of Northeastern Governors (CONEG) and Restriction of Hazardous Substances (EU RoHS) directives. Documentations for the raw materials are available upon request. Please contact our customer service department with your request. 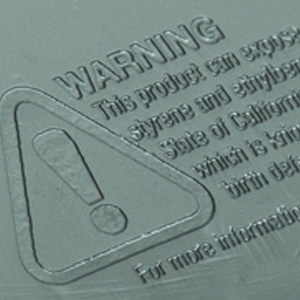 This statement defines the status of raw materials used by Midway Displays, Inc. with respect to the California Safe Drinking Water and Toxic Enforcement Act of 1986, also known as Proposition 65. 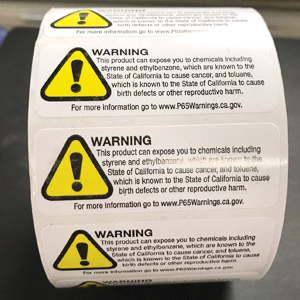 Proposition 65 requires the Governor to publish a list of chemicals that are determined by the state of California to cause cancer, birth defects or other reproductive harm. This list is updated frequently. 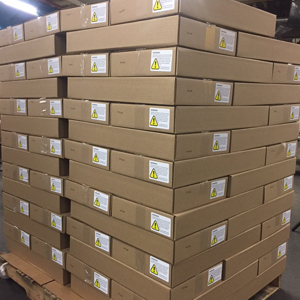 The most recent list contained approximately 900 chemicals. 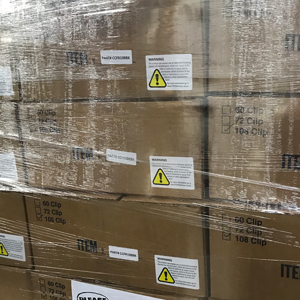 The state is further required to publish No Significant Risk Levels (NSRL) and Maximum Allowable Dose Levels (MADL) for these chemicals. 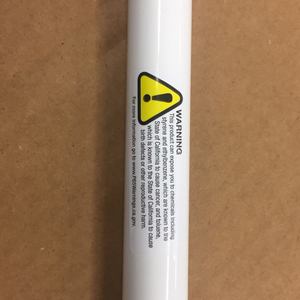 A company is required to issue a warning when it is known that one or more listed chemicals is present in a product, in the workplace, or in the emissions into the environment at these levels set by the state. 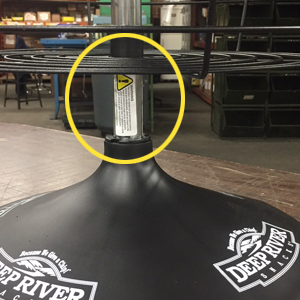 Under the law, a warning must be given unless a business demonstrates that the level to the listed chemical poses no significant risk. 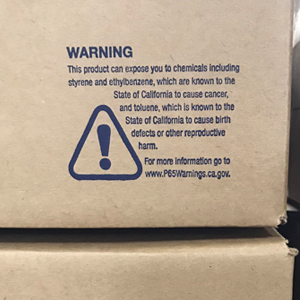 Because this product may contain low levels of Proposition 65 listed substances, Midway Displays provides the following warning. The concentration of these substances in our products is very low (Less than 0.1%) and varies by product. 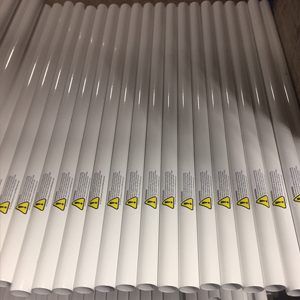 More technical information can be found on the material manufactures websites we have listed below. 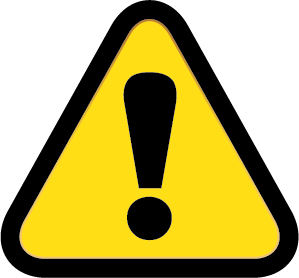 In your own interest please regularly check the information on the internet portal. 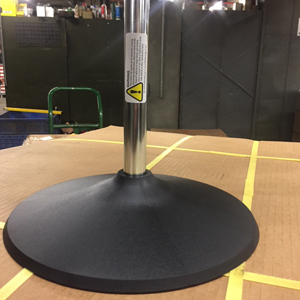 It is the responsibility of those to whom we supply our products to ensure that any proprietary rights and existing laws and legislation are observed. The statement provided is exclusively for our customers and respective competent authorities. The customer is solely responsible for determining the suitability, use and application of these products. 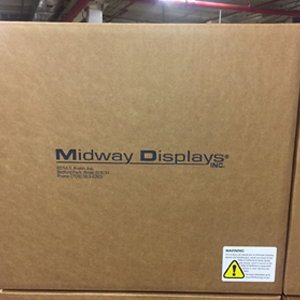 Midway Displays, Inc. disclaims any responsibility for misuse or misapplication of its products. 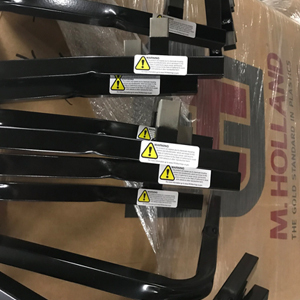 Midway Displays, Inc. expressly disclaims any warranty of merchantability, fitness for any particular purpose, suitability, accuracy, reliability or completeness of this information. In no event shall Midway Displays be liable for lost profits, special, incidental, consequential or punitive damages. 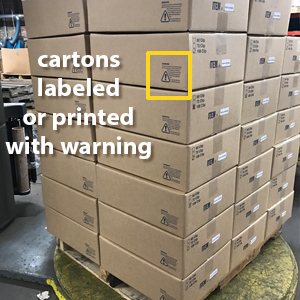 We label every display as well as each carton containing items related to California Proposition 65, before it leaves our factory. 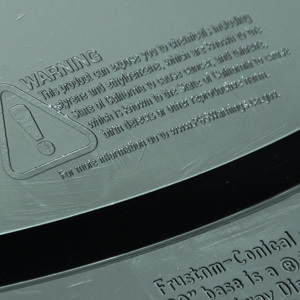 Whenever possible, we mold the warning directly into our products. Examples shown 16” and 20” bases. 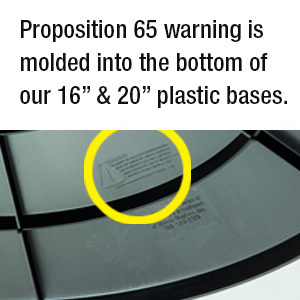 Midway Displays, Inc is not responsible, and cannot be held liable for any tampering, repackaging or misuse of Proposition 65 identification or labeling that occurs after any Items leave our factory.